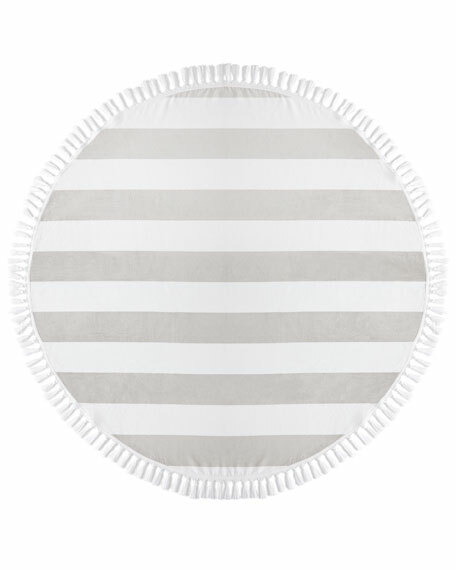 Cabana Stripe round beach towel. Beach towel with pink pattern. Cotton. Pompom trim. Machine wash. Made in Turkey. Honeycomb beach towel with lavender border. Cotton velour face; cotton terry reverse. 40" x 70". Machine wash. Made in Portugal. EXCLUSIVELY AT NEIMAN MARCUS Striped beach towel of long staple Turkish cotton. Each towel individually bagged and labeled. 525 GSM. EXCLUSIVELY AT NEIMAN MARCUS Striped beach towel of long staple Turkish cotton. Each towel individually bagged and labeled. 525 GSM. Machine wash. 40" x 70". Imported. Combed cotton beach towel. 600 GSM. 40" x 70". Made in Portugal.